You’ve probably worked pretty hard to boost rankings on search engine results pages. You’ve done all of the SEO you can imagine, and you’ve followed every tip that’s in the book to get you where you are today. On your site, you’ve done keyword research, written tons of blog posts, and even shared all of your content to your followers on social media for maximum exposure. But those high rankings don’t mean as much if another competitor owns a featured snippet for the same search queries you’re already targeting. All of your hard work will be overshadowed by the content that Google chooses to feature over everyone else ranking on page one. That’s why you need to steal your competition’s methods and beat them at their own game. 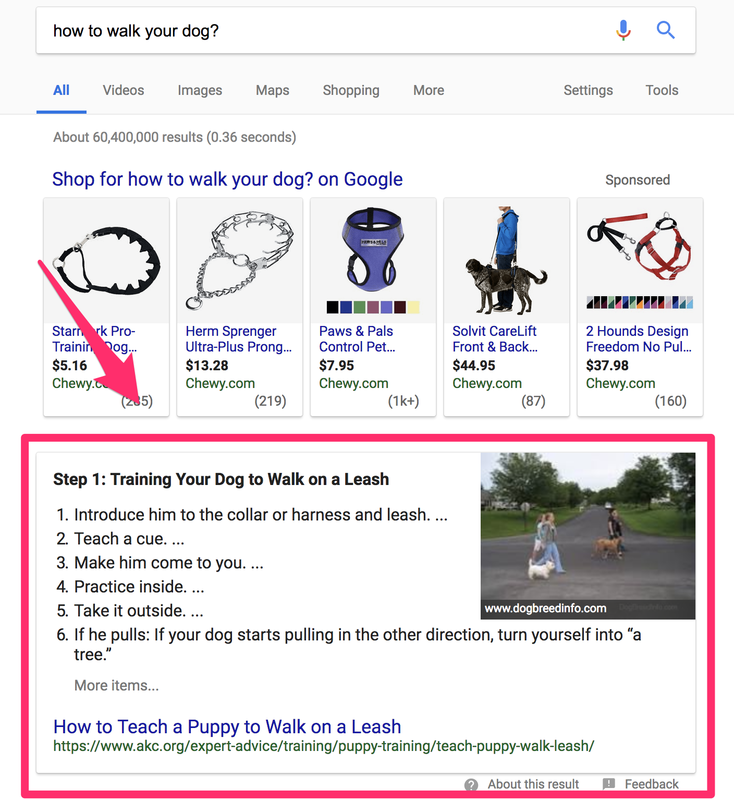 Here’s how you can steal your competitor’s featured snippets to earn even better rankings. Before we get to that, let’s talk about what a featured snippet is. A featured snippet, sometimes called a rich answer, is a featured block of information that shows up on the first page of Google above all other results. These usually show up in searches that ask a question, such as who, what, where, when, why, or how. It contains a summary of the content on the featured web page related to your search query, along with the page title, link, and featured image. For example, when you search for something like “why do dogs yawn,” you’ll see a featured snippet like this that answers your questions without clicking through to the article. Google pulls information included in the featured snippet from one of the organic listings that already appears for that query. This gives searchers a quick answer to their question without needing to leave Google. It makes searchers’ lives much easier because they don’t have to do a ton of clicking around to find what they’re looking for. It’s put right in front of them instead. If you can land featured snippets, you should see huge results, since the position of featured snippets appears above the first placement. This ensures maximum visibility and exposure because your page will literally be at position zero. To sweeten the pot, the area that featured snippets takes up is much larger than regular organic results, meaning that your content will truly be front and center. And the majority of clicks will go to you, not your competitors, since you’re shown off by Google as the main attraction. According to HubSpot, featured snippets yield a much higher click-through rate (CTR) than regular results do. For SERPs with featured snippets, 8.6% of all clicks go to the featured snippet, on average, according to research completed by Ahrefs. That means that featured snippets steal traffic from all of the organic results on the page. Even the number one result. But you don’t have to already be at position one to earn a featured snippet. The same Ahrefs research shows that only 30.9% of all featured snippets are top ranking pages. That means that if you already rank number one, you can still gain a significant increase in clicks with a featured snippet. And if you don’t rank number one, that number will be even higher. To land a featured snippet, you’ll need to make sure that your content is formatted correctly and know what content is already ranking on page one. But before we get into the specifics of how you can earn featured snippets by stealing them away from your competitors, you need to know what the different kinds are. If you don’t know which kinds of featured snippets are out there, you won’t be able to optimize your content for them. The first and most common kind of featured snippet is the paragraph featured snippet. Usually, there is a thumbnail image that accompanies it. Google then takes a chunk of the featured site’s post that most actionably answers the question. Snippets formatted as lists are usually taken from pages that list items or steps to a process. These kinds of snippets appear when searchers look for questions about how to complete a task or make something, like a recipe. Bulleted lists are triggered when the list featured contains steps that can be completed in any order, while numbered lists appear when there are ordered steps that apply. Tables come up in featured snippets with queries that request pricing or comparisons between several types of items that can be shown quickly via rows and columns. This type of featured snippet is often less common than the others, since most sites don’t properly format tables on their web pages. So if you’re going to add tables to your content, be sure to format them correctly. A featured snippet containing a video player appears when searchers look for something related to a song or movie. It can also appear when the answer to a question is contained in a video chosen as a featured snippet. Take this example for the search query “fastest bike in the world vs fastest car,” for instance. The video is pulled with the paragraph snippet format, the video thumbnail, and the YouTube link. The paragraph is commonly pulled from the YouTube video description. Put the text that you want Google to consider for your snippet at the beginning of your video’s description for best results. But this isn’t the only type of video snippet out there. In some instances, Google will show a full-sized YouTube video player that takes up the entire featured snippet space. This is a newer kind of video snippet format that Google is using to promote YouTube. More often than not, media clips or music videos that are featured contain the full-sized player within their snippet. Now that you know what the different kinds of featured snippets are, you can move on to stealing them from your competitors. There are several tools out there that can help you accomplish this, starting with SEMrush. SEMrush is commonly known for its ability to uncover information about site analytics. But did you know that you can also use it to identify the featured snippets that are currently owned by your competitors? You can also use the platform to find out which snippets, if any, you already own. To check how many featured snippets are owned by any site, begin by entering the site URL into the SEMrush homepage. Then, locate the button that says “Featured Snippet” on the right-hand side of the page. Click that to view information about the keywords that your competitors are targeting that have earned them a featured snippet. You can also filter keywords that are “snippable” by using the “Advanced Filters” option and selecting Include – SERP Features – Featured Snippets. When you’ve uncovered which snippets your competitors are ranking for, you can begin to optimize your own pages for those same terms. You can find keywords that your competitors are ranking for in those featured snippets to alter your content. You can also take a look at the SERP source to see how the snippet appears on the results page by clicking on the blue number in the row and choosing the “View SERP” button. And you can use the tool to find variations of related, relevant long-tail keywords that you could also target for the snippets that you already own. To come up with even more information about your competition, check out Ahrefs. To get started, head to the Ahrefs Site Explorer and enter your website’s URL. This will reveal any and all queries that you currently rank for that are in the top 10 of all results that also have a featured snippet. This doesn’t mean that you own every single featured snippet listed. Some of them are owned by your competitors. Next, you need to filter out all of the snippets that you own so that you can only view the snippets that are owned by your competitors. This kind of feature hasn’t yet been developed by Ahrefs, but you can use an automated spreadsheet to record the data yourself. Give your copy a customized name and select where you want to save it. Then once you’ve done that, hit the “OK” button. Now, you should have a copy of the file that you can edit and fill in with information that is specific to you and your company. Export the report that you just filtered in Ahrefs from “Organic keywords” as a CSV file. On that tab, you will be able to view a list of search queries found by Ahrefs that contain the featured snippets you don’t currently own. Ahrefs also lets you change the search volume to find long-tail keyword opportunities. Google these queries yourself to find out who owns each of the snippets for those terms. Analyze the content, because you’ll want to mimic it later. Google is another excellent tool for unmasking the snippets that your competitors have earned (and that you could earn in the future). If you want to know which content you need to optimize for snippet opportunities first, then try to think like your audience. Put yourself in their shoes. What kinds of questions do people in your industry have? Then, do a quick search for that question and find out who currently owns the featured snippet for it. Hopefully, the content is already yours. If it isn’t, make a note of your competition. Look at their content and the type of featured snippet. In the example above, it’s clear Google is pulling a paragraph format for this featured snippet. So, when formatting your content, you’ll want to write in 40-60 word paragraphs to have a chance at winning this featured snippet. Next, take a look at the “People also ask” section of the search results. This will suggest questions related to the one you originally searched. These are the similar questions that your audience is dying to know. Expand each question to find out who owns the featured content for each question listed. Just like before, click on each of these competitors and note the differences between their content covering the search query and yours. If you don’t have any posts on your site that answer questions in the “people also ask” section, think about adding these questions as header tags. The same goes for the “people also search for” section at the bottom of Google. Use this to outline your article and make sure you’re answering all of these questions or utilizing these as your keyword cluster for this particular article. Now that you know who your competition is, try to steal their snippet by doing more research and writing even better content. Once you know which snippets you don’t own, you can focus on stealing them. Now that you know which keywords and queries to target, it’s game time. If you want to rank for featured snippets, you need to take the good, effective things that your competitors have done with their featured content, mimic it, and take it to the next level. Start by learning what content is already ranking on page one. While you don’t need to always rank on page one to gain a featured snippet, it does give you a higher probability that you’ll beat your competitors. Glenn Gabe shared at the SMX East Conference in New York City last year that he found featured snippets that ranked on page two at position 16. But it is still considered a best practice to improve your organic ranking before attempting to steal a featured snippet. Otherwise, the lower your position, the higher the potential for volatile fluctuations. Rob Bucci displayed this chart at SearchLove San Diego this year to show just how volatile those lower rankings can be with featured snippets. All said and done, try to aim for keywords that already rank on page one. In some cases, your content may already contain everything that it needs to gain you a featured snippet, but your formatting might just be off. To fix this issue, you’ll need to restructure your content on pages that already answer the same questions as competitors. Did they use a bulleted list to answer the question? Use one, too. Did they answer the question with a video? Create one, too. Does their piece feature a table? Add one to your page as well. If your competition has earned a snippet without any type of structured markup on their page, you have the upper hand. That means that all you have to do to earn a featured snippet is make your content easy to read by formatting it correctly. To do this, format your page with basic HTML tags to make it more scannable. Add header tags like <h2> or <h3>, subheaders, <p> paragraph tags, and more. This will break up the sections of your piece so that Google can easily understand it’s structure. And, make sure to choose your schema markup wisely. Alan Bleiweiss was able to beat big sites like Wikipedia and Psychology Today by formatting the featured snippet correctly. Once you’ve restructured your piece, you need to go above and beyond what others in your space are doing. One of the easiest ways to elevate your content higher than your competition is to add images to it. Most featured snippets have at least one image. You need to add several to your page for best results. Pay special attention to the space directly after the content that you want to get featured. Add images there that relate to your table, list, or paragraph. This technique is commonly used by sites like WikiHow. They demonstrate each step of an article with an image. In addition to adding images, you also need to add some alt images text. But not just any text. It also needs to be SEO friendly. Alt image text describes images on your website within the source code of your pages. This helps Google understand what the images explain. To add SEO-friendly alt image tags, add relevant keywords to them, explain the image accurately within them, and keep it short. It’s recommended for alt text not to exceed 125 characters, or the text may not be read completely. While it’s great to target for keywords, you should also use keyword synonyms. Using keywords that searchers are going to be looking for in their queries is important. This is what will ultimately lead them to your pages. Google will even bold these words throughout results pages and featured snippets so that searchers can rest assured that the results match what they’re looking for. But you also need to include some synonyms of the keywords that you already want to rank for. People are searching for these terms, too. And you’re missing out on them. To find them, enlist the help of an SEO keyword suggestion tool, like this one from SEO Review Tools. Then, the tool will give you an entire list of related keyword synonyms. Add these to the content that you’re trying to earn featured snippets for. You’ve already worked hard to improve your SEO. You’ve put in hours of keyword research, content planning, writing, and more. But the high rankings you’ve worked so hard to earn won’t pay off as well as they could if another website owns a featured snippet for the exact same keywords you’ve targeted. A featured snippet is a section of content from a web page selected by Google that gives a searcher all of the information they need in one block of text at the very top of the page. This keeps searchers from having to click off to several pages before finding what they need. With a featured snippet, they’ll never have to leave Google. But featured snippets rank even higher than number one. They’re located at position zero. So you need to gain more snippets to see higher CTRs. The good news is that you can do that by stealing the featured snippets that your competitors already own. Different types of featured snippets include the paragraph, list, table, and video snippet. Each of them is triggered for a different reason, and different search queries pull up different types of featured snippets. To uncover all of the featured snippets that your competition is ranking for, you can use a tool like SEMrush. You can also use Google to figure out which snippets might be worth fighting for (and which questions your customers are searching for the answers to). Try out Ahrefs to figure out which featured snippets are owned by other brands on pages that you already rank high on. Then, prepare to steal your competitor’s snippets away from them. Restructure your content with headers and tags and take it to the next level. Add high-quality images that your competitors aren’t using. Don’t forget to include alt image text for every image you add. Finally, do some research on keyword synonyms that are related to keywords that are earning featured snippets. Target those on your pages, too. Your customers are also searching for those words. What tactics have you used to win featured snippets from your competitors? The post How to Steal Your Competitor’s Featured Snippets For Better Rankings appeared first on Neil Patel.